Since Avatar, people all over the world have been raving about 3D movies. Today, Kyan, Anya and myself watched our first 3D movie ever: Titeuf, le film.We watched the film in 3D (using the special glasses) at UGC Normandie on the Champs Elysées in Paris. 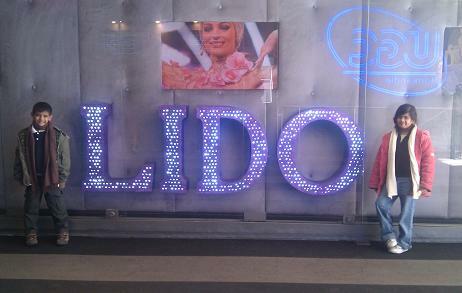 And, you know, that cinema shares the same entrance as the Lido! To be frank, I did not have a lot of expectations because, well, it was Titeuf. But I was pleasantly surprised by (1) the technical quality of the movie and (2) the quality of the narrative. 3D works well. In fact, most of the time, 3D felt more like multiple 2D planes. Those who had the Amiga will immediately understand. In 2D, there is only one plane i.e. the scene is flat. When watching 3D, we perceive multiple planes e.g. a foreground, a plane with the actors and multiple background planes used to give a sense of perspective. Most of the time, this arrangement is very effective. And I have to say that I didn’t have any issue with the glasses. No one got ill during the projection. Of course, this does not mean that all movies would benefit from 3D but, nevertheless, it’s a welcome addition to the arsenal that a film maker has. As I wrote above, I was very sceptical initially about the movie. I had watched a trailer before and I thought the movie was stupid. But, believe it or not, I actually liked the movie a lot. You see, the movie talks of divorce which is a very common occurrence in France. I believe that 60% of couples here ultimately divorce. While this might seem enormous in comparison to what we have in Mauritius, one has to wonder whether it’s better to divorce (when incompabilities arise) or whether it’s better to make as if everything is fine (as we tend to do in our small country). It’s debatable. On one hand, kids are much better with a dad and a mum. But it is also true that kids are better when they have a mum who really likes to be with the dad (and vice versa). Hypocrisy is never a good thing. I was plesantly surprise at how Titeuf manages to explain why some parents divorce without sounding too simplistic. The fact that the movie was created for kids is also interesting. For instance, after the movie, Kyan and Anya asked me a lot of questions about our family which I found very refreshing. I believe Titeuf (and similar movies) should be shown in Mauritius. And, of course, it’s not because of the 3D. one has to wonder whether it’s better to divorce (when incompabilities arise) or whether it’s better to make as if everything is fine (as we tend to do in our small country). I don’t think there is a single answer to this question. I guess each case is unique. It also depends on how old the kids are when the divorce takes place. If they are old enough they can better understand. For sure, as a kid too young to understand the situation, the last thing one wants to see is their parents separating.